The Patch King has just released our second soundbank for Arturia’s V Collection. The ARP2600 V sound collection complements our Minimoog V sounds that were released in May. Lot’s of cool analog stuff! 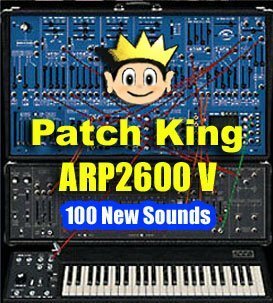 The Kid Nepro Arturia ARP2600 V Collection contains a mix of 100 new virtual analog patches ranging from fat basses to screaming leads, killer pads, cool sound effects and lot’s of great rhythms created with the ARP Model 1601 Sequencer. The collection of new sounds is done with expert care from someone who knows the classic synth very well – so you can be sure that the patches are all well crafted and sound great. Several other high quality sound libraries for Arturia synths will follow including new sounds for the Moog Modular V, CS-80V, Prophet-V & Jupiter-8V – so stay tuned!